WMH's Emergency Department treats between 17,000 and 18,000 patients every year. Staffed 24 hours a day by board certified physicians and nursing staff trained in Advanced Cardiac Life Support and Pediatric Advanced Life Support we are here when you need us. The Radiology Department and Laboratory are always staffed to ensure all of the hospital's diagnostic imaging and testing equipment including a staffed blood bank are at the ready. All of these services ensure our emergency department is capable of handling trauma, cardiac and surgical services day and night. Nearly four years in the making, the newly-expanded and renovated Emergency Department opened in total on Aug. 12, 2014. Today 18 exam rooms are in use, doubling the department’s size. One major change is the opening of two trauma rooms, also known as resuscitation rooms. Using an overhead boom, life-saving equipment is within reach of medical staff and both rooms have direct access to the CT scanner without using public hallways. 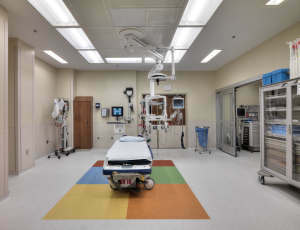 Planning was key in this space, right down to the color-blocked floor, where each color signifies the placement of a trauma team member during a code. Staffed by physicians and nurses with advanced training in trauma care, all the pieces are in place for exceptional trauma care. J. Marvyn Neri , D.O. 509 Osborn Blvd. / 500 Osborn Blvd.